Last week Spanish Prime Minister, Mariano Rajoy, warned “Spain is facing an economic situation of extreme difficulty – I repeat: of extreme difficulty – and anyone who doesn’t understand that is fooling themselves.” When the Prime Minister is willing to admit the state of affairs is extreme, we’d better take heed. As usual, here in the US we see little economic reality addressed in the evening news and have heard almost nothing about how very close to the economic abyss Spain is teetering. The situation in that country is dire. 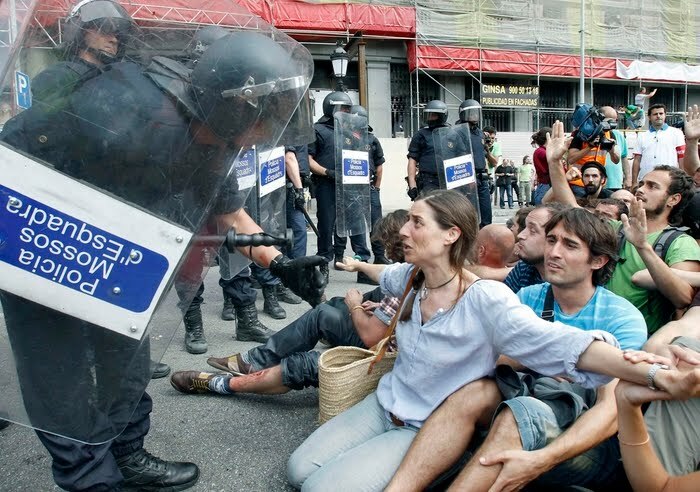 Spain is in a serious and deepening financial depression. Unemployment is up for the eighth consecutive month, as it approaches the 25% mark. The economy is contracting, with falling revenues and industrial output. The country has been wracked with strikes and massive violent protests as austerity measures cripple the financial stability of the populace. Unfortunately, more devastation is to come. I ran across some amazing statistics from Mike Shedlock last week that show the majority of the Spanish budget is dedicated to pensions, unemployment and interest… 57%, to be precise. Amazing… and totally unsustainable. Especially when we consider both unemployment and interest rates are only heading higher. There are going to be major cuts to pensions. What will happen then? The people have already taken to the streets. We are going to see more protests and more violence. The economy cannot sustain further cuts without creating worse financial damage, as well as serious sociopolitical consequences. Another shocking illustration of Spain’s proximity to disaster shows up in the story of its bond market. Last week an auction of 5-year treasuries sold a billion euros short of target. Yields were off a full percentage point on a month-over-month basis. While the previous month’s auction put the Spanish bond rate at 3.3%, this month’s auction saw bond yields increase to 4.8%. This is after the LTRO 2 (second Long Term Repo Operation by the European Central Bank) injection of an estimated one trillion euros. Five years ago we’d have expected that kind of money to fund a 2 to 3 year new business cycle, but today it just disappeared over the course of a few months into the massive financial black hole Spain has become. Banks will likely soon find themselves underwater on Spanish bonds they bought with bailout money that was given to them in order to bail them out from prior bad investment decisions. Of course that will soon put them in need of… another bailout! As we look at multiple layers of failed bailouts, we have to ask if the emperor is wearing any clothes. Yet, another bailout seems inevitable because at the base level we are talking about peoples’ lives and survival. 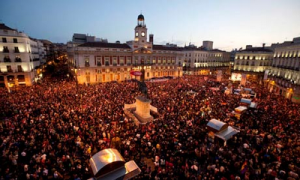 Spain will have to seek international funding. The people cannot sustain anymore austerity cuts without severe and even lethal consequences. Which brings up another piece of clear and validating evidence the country is indeed in deep trouble: the official denial of such trouble. The Spanish Economy Minister just released this official statement: “any suggestion that Madrid needs emergency international funds is absurd.” There is no better indication of real trouble than an official denial by government that such trouble exists. The Ministry of Truth has declared there is nothing to worry about, so you’d better worry. The Econ Minister probably should have met with the Prime Minister before going on record like that, just to get their story straight, ya’ know? Either way, Spain is going to implode. Spanish Epiphany As Depression Deepens? Great news, everybody! The economy is growing again! I’m sure you’ve heard the sunny stories coming out of the media recently. Growth in the fourth quarter last year hit a 3 percent annualized rate. Unfortunately, a smaller share than ever of that growth is reaching American workers but at least it’s a start, right? Oh, and when we look a little deeper into the numbers we can also see that excluding inventory building the economy actually grew at a 1.1 percent rate, which is a sharp downturn from the previous period. But hey, I don’t want to rain on the parade. Now that the economy is… uh… growing, we need to take a hard look at the future of this growth. What really is the fuel for economic growth, anyway? Population growth. And, what fuels population growth? Oil. So, what happens to growth as the oil runs out? The Paper Boat presents here the must-watch animated eye opener from Dermot O’Connor of Incubate Pictures, There’s No Tomorrow. It explains the arrival of peak energy and its important relationship to economic growth. It is about 30 minutes and provides a fantastic overview. “Peak energy” is just what it sounds like. The term refers to the moment in which we find we have used up half the world’s energy producing resources. Since the energy we use is largely generated by the consumption of oil and other petroleum products, the lifespan curve of oil acts as an indicator for the trajectory of energy use at large, as well as an indication of the state of remaining energy resources. Evidence shows peak production of accessible oil resources is upon us, while the rate at which we burn fossil fuels continues to accelerate exponentially. This video talks about the relationship between the end of cheap energy and the economic deterioration it threatens to cause. It is very important to think about how we can prepare for the effects of these dual crises ahead. Economy Grew 3.0%… or Did It? Here in Tinsel Town, Los Angeles, the headlines today are all about the Grammys and Whitney Houston’s tragic but sadly unsurprising early demise. Meanwhile, across the sea the Greek Parliment fiddles as Athens burns. Tens of thousands have taken to the streets to protest another round of newly approved austerity cuts to pensions, wages and living standards. 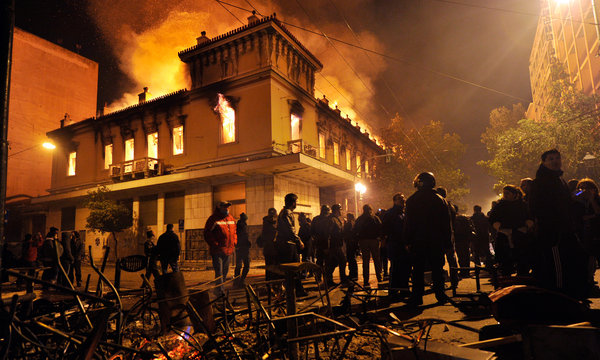 Dozens of banks and other buildings were set aflame across central Athens this morning after riots turned violent. The Greek Parliament voted to approve a package of harsh new austerity measures in exchange for a 130 billion euro bailout from the European Union and the International Monetary Fund. The new measures include a 22% cut to the minimum wage and 150,000 government layoffs by 2015, among others. With unemployment already at 21 percent and the economy and political structure in tatters, Greece is already in a deep Depression. As the Australian economist Steve Keen says, “What cannot be paid back, won’t be.” I’m afraid to say, things will only get worse for Greece ahead, and their debts are not going to be repaid. This is the beginning of the end for the European Union as it stands. I ran across a great chart this morning that clearly illustrates how the best time to buy a home is when mortgage interest rates are high. This is important to understand in today’s market, when the contrary notion that low interest rates offer some sort of rare savings opportunity is used so heavily in marketing homes and home-buying financial products. This is a great time to refinance, but it is not a great time to buy a home. 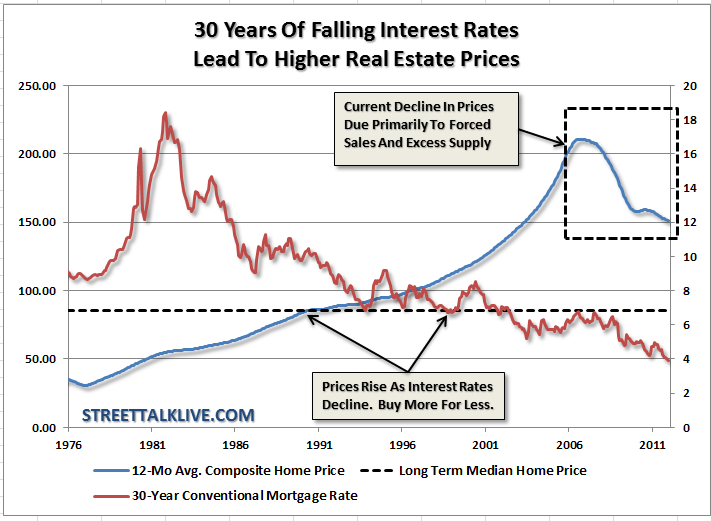 This chart offers a nice visual depiction of how interest rates relate to home prices over time. (Click on image to enlarge.) When interest rates move lower, prices move higher and counteract any savings you might think you’re getting with the low rates. Notice the dotted line across the lower third of the chart indicating the long term median home price. Look at how much higher today’s median is, as indicated by the blue line. Home prices are still quite high historically. Remember, this chart represents the US national market, not hyper-inflated urban areas like Los Angeles and Manhattan, which remain well above the national average with the lingering effects of bubble euphoria still at work. Secondly, notice the pattern the red and blue lines make – how the blue price line travels in the opposite direction of the red interest rate line. You can clearly see how prices move up as rates move down, and visa versa. If you’d have bought a house in 1981 when rates were around 18%, you’d also have been buying when prices were far below the historical norm. You’d then have had the chance to follow the interest rates down over time by refinancing at a much lower rate shortly thereafter (and again later, etc. ), while maintaining the benefits of having purchased at a great price. If on the other extreme you’d bought a house in 2006 when prices were at their peak, you’d have paid a much lower rate of interest but you’d never have the opportunity to renegotiate that price (and, normally, the tax amount you’d have signed up to pay on that purchase). Refinancing as rates fell further would only have been possible if you were not “upside down” on your mortgage, owing more money on the house than the price it would sell for in the falling market. So, you can see clearly here it is much better to buy when prices are low than when interest rates are low. With today’s interest rates at historic lows and with bubble distortion still priced into the market in many areas, home prices have plenty of room to fall. For a more in depth discussion please refer to Interest Rates: Buy When They’re High.